We all want pretty things. I mean, who doesn’t? Having pretty things makes us feel just a little bit more elated about using those things. The same thing can be said about a bullet journal. Many people, myself included, picked up this planning system because it can help be more productive and creative. It allows us the opportunity (or excuse) to create something pretty. 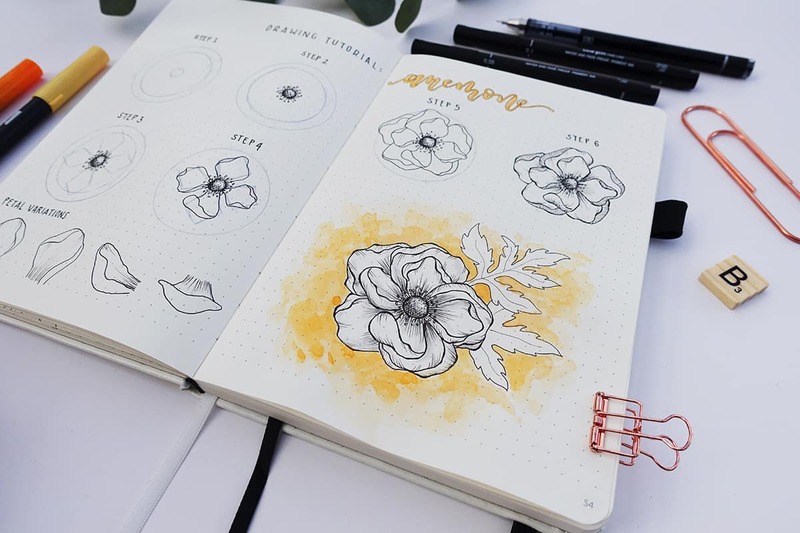 And seriously, what can be more pretty than flower illustrations in your bullet journal? 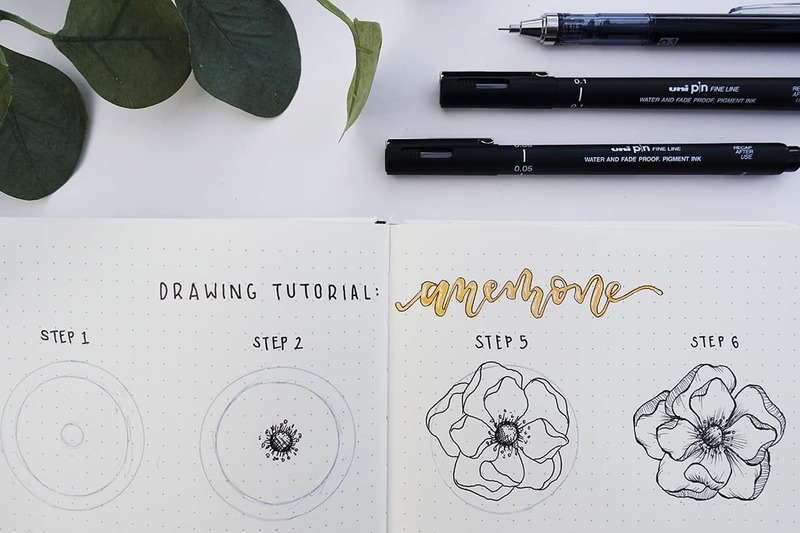 So today, I’ve created a simple step by step flower drawing tutorial that anyone can do! First and foremost, I just want to disclaim that I am a self-taught artist. My methods are probably not the correct techniques used, but honestly, who cares?! Art is about an expression of self. No one can tell you that you’re doing it wrong because really, there is no wrong. You just do it. Just sit back and let the creative process flow naturally. Don’t get hung up on the ‘proper’ way to draw. If you do, you’ll never start, and if you never start, you’ll never learn. 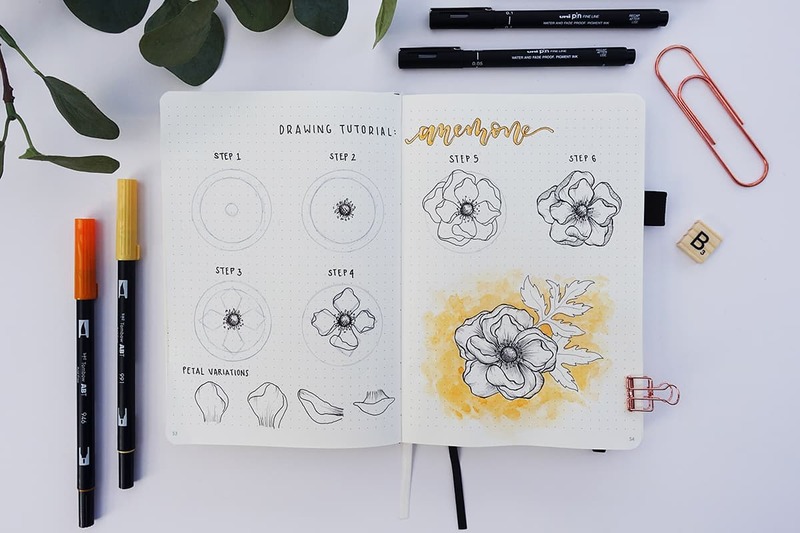 If you’re wanting to create flower drawings but you think you aren’t good enough, then I will let you in on a little secret: I only started drawing flowers when I started my bullet journal back in July 2017. I found the more I drew them, the easier they became and the better I got. It all comes back down to practice. If I can do it, anyone can. To make it even easier for you, I’ve even included an illustrated guide of the steps in my flower drawing tutorial. I’m going to share with you today my simple step by step flower drawing tutorial. 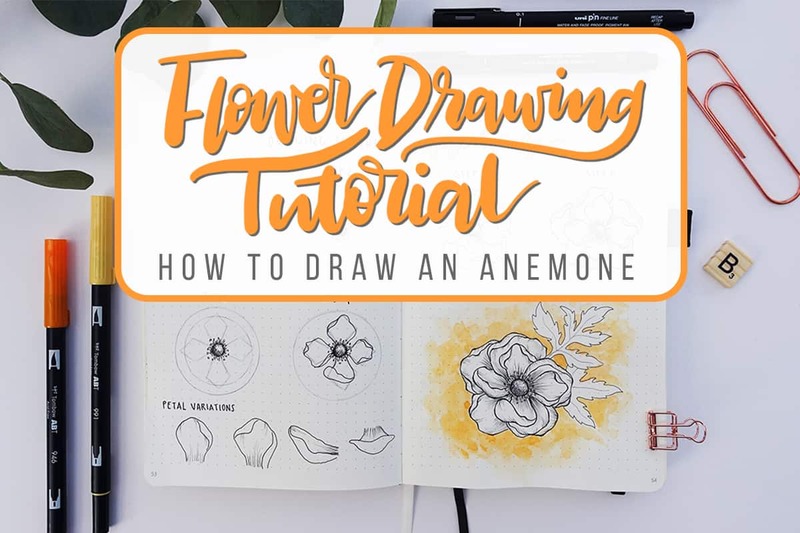 This tutorial will concentrate on how to draw an anemone flower. All you need is paper, a pencil, some pens, and faith that you can do this! So go gather your supplies and let’s proceed. Starting with a pencil, draw 3 rough circles within each other. This will help determine the size and position of your flower. The largest outer circle will be for your outer petals. The middle circle will be for your first layer of petals. Finally, the smallest central circle will be the centre of your flower. I like to draw my flowers from the middle outwards. Starting with the smallest circle, which is your mound, add details by drawing either short strokes or stippling dots. This shading will help give it some depth and dimension. Now draw small strokes all around the mound. Then add random little dots on top of the strokes for the stamen. Using the second circle for reference, start drawing diamonds around the centre of the flower in pencil. This will be the first layer of petals around your flower. You can be rough in drawing these diamonds because they are only for referencing and will be erased later. With a pen, roughly go over the diamond shapes with a more rounded and curvy line. This will give the petals more dimension. Petals are delicate and have their own unique shapes. Don’t be worried if they don’t all look uniform. In fact, you want them to all be different and irregular in shape and size! For a realistic look, vary the shape and position of the petals. Here is where you can get creative and truly make your flower unique. I’ve included a few petal variations that you can try around your flower. But there are no rules, so just draw what you feel like drawing! Using the outer circle, begin drawing the outer layer of petals. These petals are generally larger than the inner petals. Draw the outer large petal in between the two smaller petals in the first layer. The trick is to overlap the petals in this manner, regardless of how many layers of petals you decide to draw. Using a smaller tipped pen than the pen used to draw the flower, add shading to the tips of the petals. You can add shading in many different ways – either by drawing strokes, stippling, or adding color. Here, I used strokes to add shading. To determine which direction to draw your strokes, you must first decide which direction you want your petals to flow. Draw the strokes in the same direction as the flow of your petal. Once you’re done, use your eraser to erase all your pencil lines. As an optional step, you can further complete the look by adding leaves, a stem, or color to your flower. The final look of your flower will help determine whether you want to do this step or not. 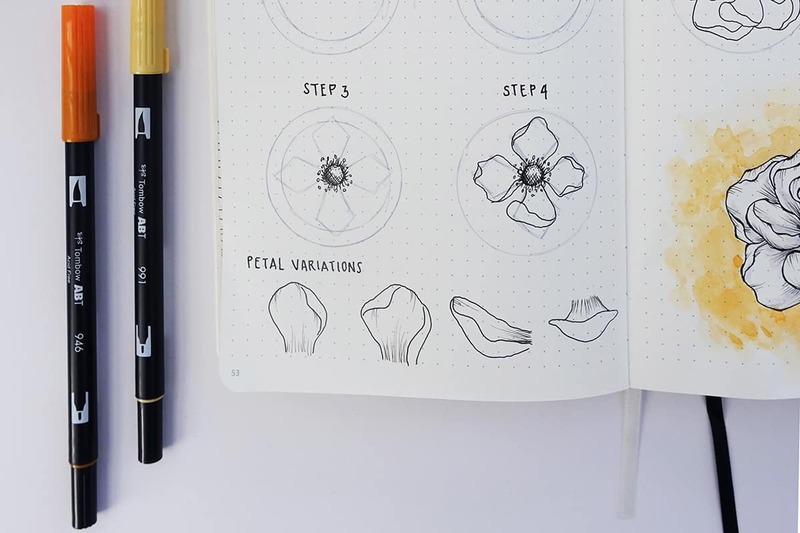 I hope this step by step flower drawing tutorial will help demystify the process for you. It looks much more difficult than it actually is, so give it a try! And remember, drawing should be a fun process. If you are not enjoying it, it means you’re putting too much pressure on yourself. As they say, ‘Rome wasn’t built in a day’. If your first efforts weren’t what you were hoping for, just keep practising. I promise you that you will get better. In the meantime, just enjoy the creative process. this is excellent! 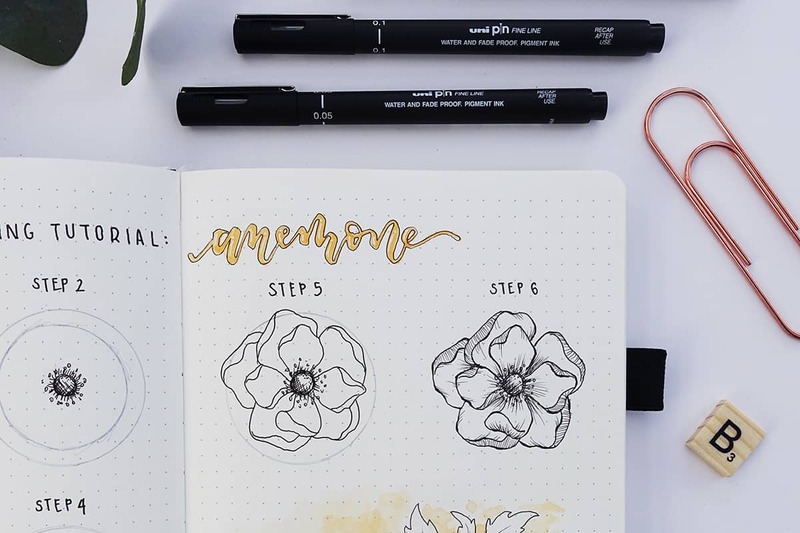 I would *love* to see more flower/botanical how-to guides, particularly using Tombow markers! Thank you so much Shelby. I channeled your talent and my flower came out beautifully! So glad you were able to draw a flower with Kim’s amazing guidance! She is one of our contributing writers and she happens to be pretty awesome. So happy to hear that Liz!! Great tutorial, Shelby. Could you show us how you got that lovely yellow coloring around the flower? Glad to hear you enjoyed it Jo! This post was done by one of our contributing writers (Kim over at bumblebujo) and she just used watercolor!